When I was 11 years old, I asked my parents to buy me a bicycle. They told me that they would buy me a bicycle only if I get first rank in School for three consecutive months. That was their way of saying No to me. So I only had a chance to ride my sister's bicycle. It was a red color BSA SLR. What made it worse for me was that it was a ladies bicycle. My classmates would make fun of me when I took that cycle to school. So I decided to get first rank for three consecutive months and make my parents buy me a men's bicycle. Eventually I succeeded only when I turned 14. My dad kept his word and bought me a double shock absorber cycle( Hercules Rockshox). Back then, owning such a cycle would me that you are cool. But there was a problem. As I was short, it was pretty difficult to ride that cycle. More often, I would sit on the bar and ride the cycle. 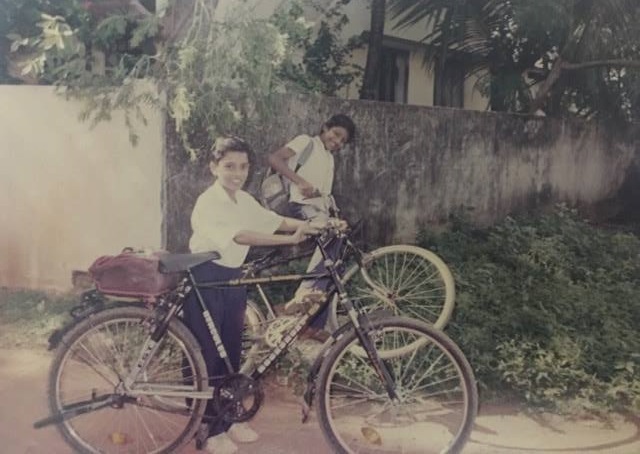 Every morning Pravin and I would go together to school in our bicycles. We would race with each other, try riding it without holding the handlebar and try various stunts. After school, we would paint the roads by exploring and navigating through all the streets en-route to our home. I had this cycle even in my college days. Today, people buy bicycles to exercise. Back then it was our only mode of transport. May be I would buy a cycle someday and start riding it again. Using the right brake for the stopee effect. Because of my short stature, I would literally sit on the bar and ride the cycle and most of the time, the bar played a big part in me lying down and writhing in pain. Even though it hurt the sensitive parts of my body, I would make it a point to ride this cycle, because I loved the cycle. Do you have memories with your bicycle? Rockshox was a big thing then. I had a "Hero Ranger". Thanks for the memories. Yah only rich kids could afford this . My dad bought me this cycle in parrys, Chennai in 1997..i treasured it like a child.. i was tall so i can do a push up on the front suspension every now and then and it looked totally cool..i i even used it in my college first year and then i had an accident riding it.. My chin was broken due to front brake lock.. So i left it in my college for someone to use.. after a year i saw it was repaired and some labour guy was using it... Felt great for helping someone as well as seeing my rockshox alive again..